XOXO Jes - Canadian Entertainment News: Celebs and their Charitable Photo Ops. Celebs and their Charitable Photo Ops. When celebrities do charitable work I always wonder if it was their idea or their publicist's. Miley Cyrus was recently photographed on a trip she took to Haiti to give out hearing aids with the Starkey Hearing Foundation. Now was this her initiative or her handlers? That is the question...sad that I even think this, but sometimes you just have to ask. Also...I love that Coke made its way into this photo op. It was Miley's idea she has been involved with the Starkey Hearing Foundation before and this is her second or third time going, before she went with her mom but loved it so much that she wanted to go back. 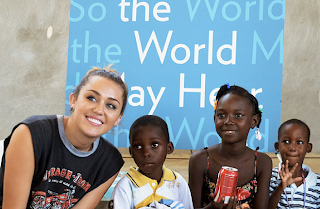 Miley has always been really connected with music and her voice and finds the work so important and rewarding as she is able to see children hear themselves and their friends/family for the first time ever.